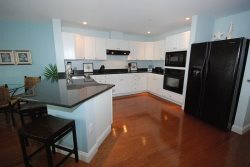 Unfurnished 3 bedroom 3 bath townhome in Freeport Village offers hardwood floors 3 levels of living space. Townhome includes hardwood floors, granite countertops, , stainless appliances and a large pantry perfect for kitchen storage. Open concept first floor offers a great space for entertaining. Second level includes 1 bedroom and 1 full bath. Third level includes the master suite and a second guest bedroom with a full bath. Townhome has a 1 car garage, a full unfinished basement and a large attic on the third level.